Mildred Barnes Bliss was an enthusiastic patron of the Musical Art Quartet. She supported the string quartet from soon after its inception in 1926 until it disbanded in 1944. The quartet performed in the Music Room each year between 1941 and 1944, and it was largely due to the success of these performances that Dumbarton Oaks decided to inaugurate a Friends of Music concert series in 1946. Mildred Barnes Bliss was an enthusiastic patron of the Musical Art Quartet. 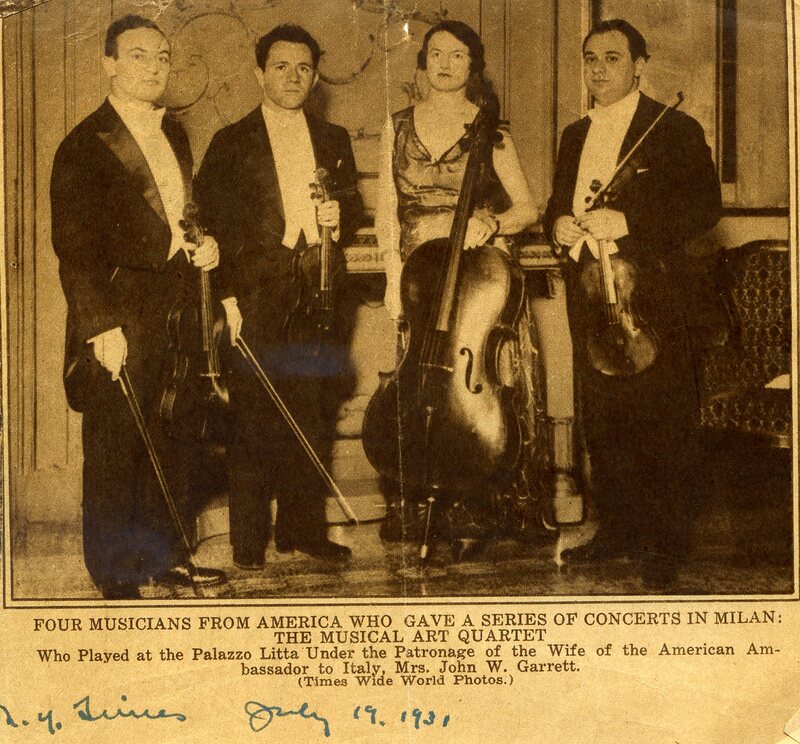 She supported the string quartet from soon after its inception in 1926 until it disbanded in 1944. Initially, the Musical Art Quartet comprised four students from the Institute of Musical Art in New York, later known as the Julliard School of Music. The Quartet’s founder and first violinist, Sascha Jacobsen (1895–1972), and cellist, Marie Roemaet-Rosanoff (1896–1967), both became friends of Mildred Bliss, and she frequently invited the Quartet members to perform at Dumbarton Oaks and also helped them to book engagements at her friends’ homes and at concert halls. After Dumbarton Oaks transferred to Harvard University in late 1940, the Musical Art Quartet performed in the Music Room each year between 1941 and 1944, and it was largely due to the success of these performances that Dumbarton Oaks decided to inaugurate a Friends of Music concert series in 1946. In 1937, several patrons joined together to acquire for the Musical Art Quartet string instruments made by the famed Antonio Stradivari (ca. 1648–1737), so that the group could remain an all-Stradivarius quartet. The banker Felix Warburg (1871–1937) had previously provided the Quartet with Stradivarius instruments from his collection, but on his death in 1937 they were returned to his estate. To replace the Warburg instruments, Alice Garrett, wife of the former U.S. ambassador to Italy, purchased a 1732 violin (“Red Diamond”) for Jacobsen; Caroline Marmon Fesler purchased a 1730 cello (“Ben Venuto”) for Rosanoff and a 1703 violin (“Allegretti”) for second violinist Paul Bernard; and Mildred Bliss purchased a ca. 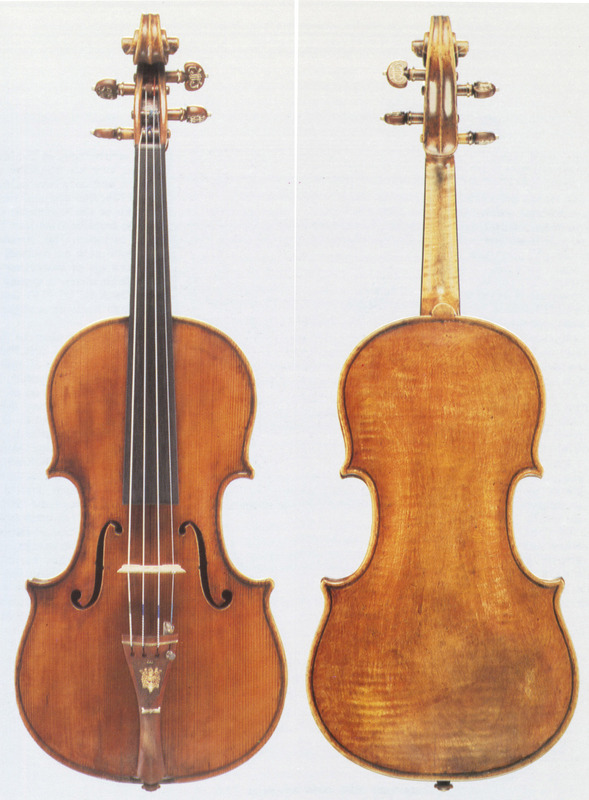 1734 viola (“Saint Senoch,” also known as the "Gibson") for Louis Kievman (1910–1990). When Kievman left the quartet in 1937, the Blisses lent the viola to William Hymanson (1914–2015), who joined the quartet that year. Thought to be the last viola made by Stradivari, the “Saint Senoch” took its name from Édouard Haincque de Saint-Senoch (1826–1885), who had owned a quartet of Antonio Stradivari’s instruments, which were dispersed after his death. The Blisses eventually sold the viola in 1961. We do congratulate you heartily on having found this excellent little house under such advantageous terms. It really does seem an extraordinary opportunity, and I am delighted that California will henceforth be able to claim you for part of the year. Let me know when you have moved in. Also, please let me know if you can come up to [Doda] Conrad’s concert. It would be delightful if one’s musical friends down the coast could join us that night. I suppose [Jascha] Heifetz won’t give up one peaceful evening or day on the beach during his well-earned and short-lived holiday. Give him my greetings and tell him he would be most welcome if at any time he can come up with you. therefore, would it not be more advantageous for the Quartet to play concerts at the Museum against your indebtedness to me? You thus would get the audience, publicity, prestige. The Museum would have fine concerts under its auspices and on its premises and you would reduce your indebtedness. I shall be most happy to do this for the Quartet and the Museum, so let me know how you feel about it. 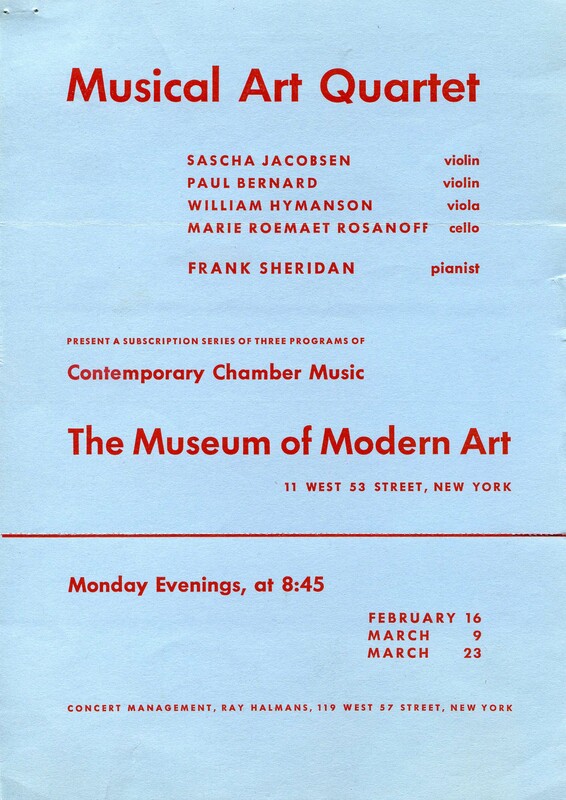 The Musical Art Quartet gave concerts at the Museum of Modern Art on February 16 and March 9 and 23. Tickets for single performances ranged from $1.65 to $2.20.